On Monday 3rd February we are really pleased that there will be 2 tweet chats for the physiotherapy community with the Health and Care Professions Council (HCPC), the regulatory body for physiotherapists and other healthcare professionals in the UK. This is a great opportunity, and as this week’s #physiotalk chats will run slightly differently to our previous chats please read through the information below to make the most of these tweet chats with @The_HCPC. The chats have been timed to coincide with the start of the registration renewal period for Physiotherapists in the UK. Physiotherapists will enter this registration renewal period on Saturday 1 February 2014 and will have until Wednesday 30 April 2014 to renew their registration with the HCPC. All physiotherapists will receive renewal letters shortly, together with a reminder of the authentication codes for the online renewal system. As part of the renewal process, the HCPC audits 2.5% of the profession and those who are randomly selected for audit will soon be notified. The first chat will be hosted by @the_HCPC. From 12-2pm GMT the HCPC registration team members will be on hand to answer any questions you have about your registration. Holding a chat at this time of day means that you have ‘live’ access to HCPC staff to ask questions about registration, CPD and the renewals process. 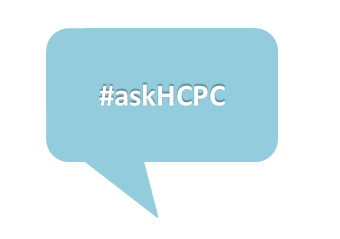 Please use the hashtag #askHCPC to ask the team any questions during 12-2pm. We know that not everyone has access to Twitter during the working day, so please feel free to submit questions ahead of time using #askHCPC. You can start doing this from Sunday 2nd February. During this chat the HCPC can provide you with some helpful tips on registration, how to document your CPD, what examples of CPD you can submit in your audit profile, and look more closely at HCPC standards. As this is more of a question and answer session you can dip in and out rather than having to join in for all of the chat, and it should also be easier to take part using hand-held devices. We will go back to our normal chat format in the evening, hosted by the physiotalk team, and when @the_HCPC will join us again 8-9pm (GMT). This chat will follow our normal discussion format using the hashtag #physiotalk and will focus on CPD. It will be an opportunity for everyone to discuss and share experiences of CPD and talk about statutory expectations, as well as those of our workplaces. Although this chat will focus around HCPC requirements in the UK we hope it will also be useful for our international colleagues. What CPD activities do you find most useful for your role? How do you document your CPD activities? Have you taken part in an HCPC CPD audit in previous years and how did you find it? How does your workplace support CPD? What are the CPD requirements for physiotherapists working in or moving into research / education / management? Are you following @The_HCPC on Twitter?! How do you renew your registration? Do you use the online renewal system? What do you find are the challenges in renewing? Has anyone been selected for audit? Would you like some examples of CPD activities? Do you find the CPD videos a useful tool? Do you keep a diary of your CPD activities as you go along? Do you have any questions for @the_HCPC? You might also find it useful to have a look at the Storify and post-chat transcript from @The_HCPC tweet chats with our #OTalk colleagues last October.